You may be excited about cutting-edge advances in brain research, but do you know how to translate them into practical methods that may reduce clients’ resistance, transform deeply disturbing emotions, and reinforce treatment interventions? Clients can be taught to locate hidden strengths and dissolve distress by activating their brains’ reward centers. In this workshop, we’ll use tools developed from memory reconsolidation and Polyvagal Theory. Kate Cohen-Posey, MS, LMHC, LMFT, is the director of Psychiatric & Psychological Services in Lakeland, FL and has 40 years of clinical experience. Her best-selling client handout books offer concise information on common disorders and relationship problems; Making Hostile Words Harmless teaches how to disarm attack-defend-withdraw neural pathways and is endorsed by Stephen R. Lankton, protégé of Milton Erickson; Empowering Dialogues Within gives more than 50 examples of brain change strategies by wiring negative brain centers with their counter parts in the positive frontal lobe through dialogue. She is the inventor of the Handy Brain Model – a teaching tool that makes complex neurological information understandable. Kate has a knack for integrating wisdom from CBT, Ericksonian hypnosis, Gestalt, Ego State, EMDR, Somatic, and Brain-spotting therapies with knowledge emerging from neuroscience and brain imaging studies. She has also studied with the Hokori-Ji Zen Center and has been practicing yoga for many years. Financial: Kate Cohen-Posey receives compensation as Director of Psychiatric and Psychological Services. She receives royalties as an author from John Wiley & Sons, Inc., and Rainbow Books, Inc. Ms. Cohen-Posey has an ownership interest with Handy Brain Model. Kate Cohen-Posey receives a speaking honorarium from PESI, Inc.
Nonfinancial: Kate Cohen-Posey is a member of the Eye Movement Desensitization & Reprocessing International Association (EMDRIA); and the American Association of Marriage and Family Therapists (AAMFT). Save time and $10 off the price of other submission methods – purchase & take the CE test online for $9.99 USD per participant. Additional processing fees apply for other submission methods (i.e. mail, fax, etc.). Please contact our Customer Service at 1-800-844-8260 for more details. 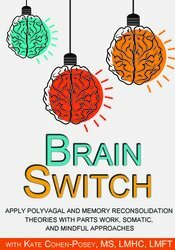 *PLEASE NOTE: This is the same content as Brain Switch: Turning Reactivity into Equanimity at the 2018 Psychotherapy Networker Symposium, you cannot receive self-study credit for this program if you have already attended the live workshop. This self-study course has been approved by PESI, Inc., as a NAADAC Approved Education Provider, for 2.0 CE in the Counseling Services skill group. NAADAC Provider #77553. PESI, Inc. is responsible for all aspects of their programming. Full attendance is required; no partial credit will be awarded for partial attendance. California Alcoholism & Drug Abuse Counselors: PESI, Inc. is an approved provider by the CCAPP-EI, Provider #: OS-03-036-1019. This self-study activity meets the qualifications for 2.0 CEH's (continuing education hours). Connecticut Addiction Counselors: Provider #120924. This course has been approved as a CCB approved training and has been awarded 2.0 hours by the Connecticut Certification Board. This intermediate self-study activity consists of 2.0 clock hours of continuing education instruction. Credit requirements and approvals vary per state board regulations. Please save the course outline, the certificate of completion you receive from the activity and contact your state board or organization to determine specific filing requirements. New York Counselors: PESI, Inc. is recognized by the New York State Education Department's (NYSED) State Board for Mental Health Practitioners as an approved provider of continuing education for Licensed Mental Health Counselors. #MHC-0033. This self-study activity will qualify for 2.25 contact hours. Full attendance is required; no partial credits will be offered for partial attendance. South Carolina Counselors, Marriage & Family Therapists and Psycho-Educational Specialists: This program has been approved for 2.0 continuing education hours by the South Carolina Board of Examiners for Licensure of Professional Counselors, Marriage and Family Therapists, and Psycho-Educational Specialists. Provider #4540. Texas Counselors: PESI, Inc. has been approved as a continuing education sponsor through the Texas State Board of Examiners of Professional Counselors. Provider #: 2477. This self-study course qualifies for 2.0 continuing education credits. This self-study activity consists of 2.0 clock hours of continuing education instruction. Credit requirements and approvals vary per state board regulations. Please save the course outline, the certificate of completion you receive from this self-study activity and contact your state board or organization to determine specific filing requirements. Illinois Marriage & Family Therapists: PESI, Inc. has been approved as a provider of continuing education by the State of Illinois, Department of Professional Regulation. Provider #: 168-000156. Full attendance at this self-study activity qualifies for 2.0 credits. New York Marriage & Family Therapists: PESI, Inc. is recognized by the New York State Education Department's (NYSED) State Board for Mental Health Practitioners as an approved provider of continuing education for Licensed Marriage and Family Therapists. #MFT-0024. This self-study activity will qualify for 2.25 contact hours. Full attendance is required; no partial credits will be offered for partial attendance. Texas Marriage & Family Therapists: PESI, Inc. has been approved as a continuing education sponsor through the Texas State Board of Examiners of Marriage and Family Therapists. Provider #: 503. This self-study activity qualifies for 2.0 continuing education credits. This intermediate activity consists of 2.0 clock hours of continuing education instruction. Credit requirements and approvals vary per state board regulations. Please contact your licensing board to determine if they accept programs or providers approved by other national or state licensing boards. A certificate of attendance will be awarded at the end of the program to participants who are in full attendance and who complete the program evaluation. California Nurses: PESI, Inc. is a provider approved by the California Board of Registered Nursing, Provider #:17118 for 2.0 self-study contact hours. Florida Nurses: PESI, Inc. is an approved provider by the Florida Board of Nursing. Provider #: FBN2858. These materials qualify for 2.0 self-study contact hours. Iowa Nurses: PESI, Inc. is an approved provider by the Iowa Board of Nursing. Provider #: 346. Nurses successfully completing these self-study materials will earn 2.0 self-study contact hours. This self-study activity consists of 2.0 clock hours of continuing education instruction. The following state psychologist boards recognize activities sponsored by PESI, Inc. as an approved ACCME provider: Alaska, Arkansas, California, Colorado, Georgia, Illinois, Indiana, Kentucky, Maine, Maryland, Missouri, Nebraska, Nevada, New Hampshire, New Jersey, New Mexico, Oklahoma, Pennsylvania, South Carolina and Wisconsin. Certificates of attendance will be issued for you to submit to your state licensing board to recognize for continuing education credit. Full attendance is required; no partial credits will be offered for partial attendance. PESI, Inc. is accredited by the Accreditation Council for Continuing Medical Education to provide continuing medical education. PESI, Inc. designates this self-study activity for a maximum of 2.0 AMA PRA Category 1 Credit(s)™. Physicians should only claim credit commensurate with the extent of their participation in the activity. Florida Board of Psychology: PESI, Inc., is an approved provider with the Florida Board of Psychology. Provider Number 50-399. This product qualifies for 2.0 self-study continuing education credits. Please make sure to bring your license number to the seminar so that we can report your attendance to CE Brokers. California Social Workers/ Counselors/Marriage & Family Therapists/Licensed Educational Psychologists: This intermediate activity consists of 2.0 clock hours of continuing education instruction. Credit requirements and approvals vary per state board regulations. Please contact your licensing board to determine if they accept programs or providers approved by other national or state licensing boards. A certificate of attendance will be awarded at the end of the program to participants who are in full attendance and who complete the program evaluation. Colorado Social Workers: PESI, Inc. is an approved provider with the Colorado Chapter of the National Association of Social Workers. Provider #1413. This course has been approved for 2.0 continuing education hours. Florida Social Workers/Marriage & Family Therapists/Mental Health Counselors: PESI, Inc. is an approved provider with the Florida Board of Clinical Social Work, Marriage and Family Therapy and Mental Health Counseling. Provider Number 50-399. This self-study course qualifies for 2.0 continuing education credits. Illinois Social Workers: PESI, Inc. is an approved provider with the State of Illinois, Department of Professional Regulation. License #: 159-000154. Successful completion of this self-study activity qualifies for 2.0 contact hours. Kansas Social Workers: PESI, Inc. is an approved provider with the Kansas Behavioral Sciences Regulatory Board. Provider #14-006. This self-study course has been approved for 2.0 continuing education hours. Minnesota Social Workers: PESI, Inc. is an approved provider with the State of Minnesota, Board of Social Work. Provider #: CEP-140. This self-study course has been approved for 2.0 continuing education hours. A certificate will be issued upon successful completion of a post-test. New York Social Workers: PESI, Inc. is recognized by the New York State Education Department's (NYSED) State Board for Social Work as an approved provider of continuing education for licensed social workers #SW-0008. This self-study activity will qualify for 2.25 contact hours. Full attendance is required; no partial credits will be offered for partial attendance. Expires: December 31, 2020. Ohio Social Workers/Counselors/Marriage & Family Therapists: PESI, Inc. is an approved provider with the State of Ohio Counselor, Social Worker and Marriage & Family Therapist Board. Provider approval #: RCST071001. Successful completion of this self-study course meets the qualifications for 2.0 clock hours of continuing education credit. Pennsylvania Social Workers/Counselors/Marriage & Family Therapists: This intermediate activity consists of 2.0 clock hours of continuing education instruction. Credit requirements and approvals vary per state board regulations. Please contact your licensing board to determine if they accept programs or providers approved by other national or state licensing boards. A certificate of attendance will be awarded at the end of the program to participants who are in full attendance and who complete the program evaluation. Full attendance is required, variable credits may not be awarded per the Pennsylvania State Board. This self-study activity qualifies for 2.0 clock hours of instructional content as required by many national, state and local licensing boards and professional organizations. Retain your certificate of completion and contact your board or organization for specific filing requirements.